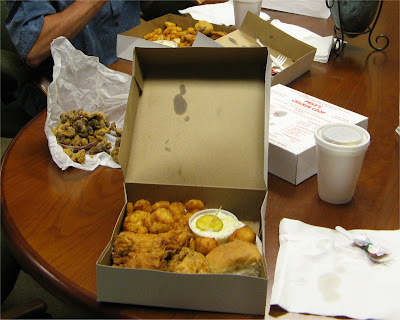 Behold a box of Prices Chicken Coop ¼ white dinner, complete with a side of fried chicken gizzards and a sweet iced tea. This is what we had for lunch. Prices is an institution in Charlotte, much like the Varsity is in Atlanta, GA.
At lunch time, garbage collectors stand along with bank vice presidents in one of six lines to get fried chicken, fried fish, or fried shrimp. The chicken is so good that I have never ventured further down the menu. It is not over battered, nor over cooked, and it is always moist. Its cash only, they do not take credit cards, and there is no dining area. The streets are lined outside with people eating in their cars or sitting on a nearby park bench to eat this marvelous food. Well, that will do me for a few years on the grease, but it sure was good. And about the gizzards…someone accused me recently of not being Southern enough. Give them a try Liv. They are wonderful. I’m taking the rest home to Gigi. She is a gizzard eating chick. I'll take the 1/4 white meat but the word gizzard makes me gag. I LOVE gizzards! I've never met another person besides my family that will admit to it though! When my second child was 3 he was in a rather "nice" mother's morning out and they had a picnic. I had to work, so I asked my nanny to bring a picnic lunch and meet us there for lunch--I always included her in the school stuff--in fact, the other kids always said the my kids had a brown mommy and a beige mommy. Anyway, I was quite pregnant with number three and I told her I just had to have gizzards-would she fry some and bring them? She never forgave me for embarassing her at the picnic with those gizzards. She just knew everyone in town was talking about us sitting there eating those gizzards! Oh Ellie...sister Ellie. Thank you. Chicken gizzards are wonderful comfort food. We ate gizzards with gravy over rice as a child. It was cheap food. Fried gizzards are the best. Exactly what part of the chicken are the gizzards? I'm a happy Yankee who never ever wants to try fried chicken gizzards. Blarg! For pete's sake. I said that you were more southernly in person than your blog typically portrayed. You are more than making up for it with this post. Logzilla, Gizzards are part of the digestive part of a chicken and are a member of the giblet family which includes the heart and liver. Have you ever had giblet gravy at Thanksgiving? It had Turkey gizzards in it. Gizzards are very tough and must be cooked a very long time to become tender. Kuckie will back me up on this, she is a chicken person. I think in my dictionary, under "gizzards", it says "really gross stuff". My goodness, the things people will eat!! There are perfectly fine other things in the world to eat, like tofu or sauerkraut.